If you use ToolBook to create training, this book is for you. 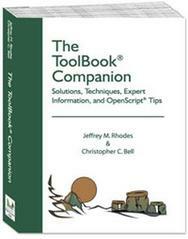 With 450+ pages of articles and explanations, there is something here for every level of ToolBook developer. The first section, Training Solutions, contains articles on various aspects of using ToolBook to create training. These range from case studies to specific examples on when and how to use 3D animations in training. Learn about incorporating media into ToolBook as well as one approach to creating a tracking system in ToolBook. ToolBook Techniques, the book's second section, gets into more ToolBook-specific content. Creating Let-Me-Try simulations, OpenScript techniques, Installation approaches are all covered here. Expert Information includes over 200 important pieces of information on ToolBook. Whether discussing undocumented features, unexpected approaches, or critical solutions to common problems, you'll find valuable information here. Finally, OpenScript Tips include OpenScript examples with running commentary. Free shipping in U.S.